Old Story - Still No Answers:Is the U ever going to do anything about the double-dipping situation? U Admin: Sainfort, Jacko Being Treated Unfairly? A single guilty plea has ended the criminal prosecution of two University of Minnesota professors accused of drawing salaries from a pair of public universities at the same time. In an Atlanta courtroom Monday, Francois Sainfort pleaded guilty to one felony count, was ordered to pay $43,578 in restitution and sentenced to five years' probation, after which his record would be cleared. The Georgia Attorney General also agreed not to prosecute Sainfort's wife, Julie Jacko, or her brother Robert Jacko. Both were indicted last year but those charges have been dismissed. The deal closes a dispute that laid bare the intense recruitment battles for top-tier researchers. It also comes in the wake of legislative hearings and increased scrutiny of the U's handling of pay and severance agreements. "This has lasted four years, so I am relieved that it is finally behind me," Sainfort said by phone. "I am very appreciative of the University of Minnesota for standing by me and my wife during these difficult times." In a statement Monday, the university said its administration "will carefully consider the facts associated with the case and determine how best to proceed. This remains a private personnel matter. No decisions will be made in the near term." Sainfort said that the U has been "very supportive" and that he "would not expect anything to change." Jacko and Sainfort were disciplined by the U in 2010 after the dual-pay allegations surfaced. Much of this case has centered on e-mails between Sainfort and his Georgia Tech higher-ups. In one, Sainfort claimed a "completely full" schedule at Georgia Tech at the same time the University of Minnesota said he was working full time in Minneapolis. Sainfort's plea to one count of false statements and writings referred to a February 2008 e-mail exchange. "As a matter of fact, Julie and I have not even signed an employment contract yet with Minnesota," his e-mail said. "We have only agreed to unofficially start this semester with full residence starting in May so that they can put the searches to rest and announce it to our respective units." In March 2011, Sainfort and Jacko were indicted in Georgia -- Sainfort on 14 counts of conspiracy, theft and false statements and Jacko on 11 counts. The 27-page indictment highlighted travel expenses the pair charged Georgia Tech for trips to Minnesota. But in December 2011, the attorney general's office dismissed the indictment, according to a filing in the case. In a phone call Monday, Sainfort and his attorney, Wilmer "Buddy" Parker, declined to discuss why Sainfort sent that e-mail. Parker maintains that both Sainfort and Jacko are innocent and were forthcoming with both universities about their employment. "There was never any dual employment," Parker said. Georgia's First Offender Act allows Sainfort's guilty plea to be dismissed if he successfully completes five years of probation. Greg Lohmeier, Georgia's assistant attorney general, called it "a very satisfactory outcome." "This was, always, a policy violation," Lohmeier said. "The question became, OK, how is this a criminal case? That was one of the things we struggled with." Georgia Tech has agreed to accept the amount being ordered in restitution as settlement of any remaining claims, said a university spokesman. Sainfort also had "a viable claim" against Georgia Tech for about $40,000 in unpaid vacation leave -- close to the amount ordered in restitution, which was based on what he owed for improperly billing travel expenses, Lohmeier said. "Given the amounts involved," he said, "we just called it a wash."
The University of Minnesota spent two years wooing the pair of professors away from Georgia Tech and bringing them to the U, where they currently are professors in the U's School of Public Health. They specialize in making sense of health data. Jacko made headlines in 2010 for bringing in a $5.15 million grant to train health care professional in "health informatics," a field that uses electronic medical records to improve patient care and soothe administrative headaches. Her online biography says that she has generated nearly $15 million in research funding in the past 10 years. U nursing Dean Connie Delaney said in a February interview that Jacko was hired as a consideration to the primary hiring of Sainfort. She said Sainfort was a "very significant hire'' in the School of Public Health. Jacko's affiliation with nursing was short-lived. She requested and was granted a transfer to the School of Public Health, Delaney said. Allegations of double-dipping first arose in 2008, leading Sainfort to resign as head of the School of Public Health's Division of Health Policy andManagement. In late 2010, the U disciplined the pair, imposing a total of about $59,000 in fines for fringe benefits and travel expenses also reimbursed by Georgia Tech. Sainfort was fined $44,024 of that, reflecting the fact that the U's investigation found Sainfort "largely responsible for" issues during Jacko's transition. It's nice to hear that Dr. David Metzen, former University of Minnesota regent, has gotten religion on graduation rates..
ST. PAUL, Minn. — Two former deans have filed whistleblower lawsuits against the Woodbury-based Minnesota School of Business - Globe University. Heidi Weber and Jeanne St. Claire said they were fired for complaining about misleading practices at the for-profit college. Weber of Prescott, Wis., was dean of the medical assistant program in February 2010. In the lawsuit, she alleges the school violated multiple accreditation standards and hushed it up. Weber alleges that the school: paid commissions to recruiters; failed to tell students that problems such as felonies could hurt their job prospects; and failed to provide enough training opportunities for students. Weber also says in the lawsuit that major employer Allina Health Systems stopped taking Globe students because of declining accreditation standards. The suit claims Globe University never told students what was happening. Weber said she took her complaints to both the owner and top executives, including Provost David Metzen, the former director of the state's Office of Higher Education. Weber said executives were indifferent to her complaints. "It wasn't a surprise, basically," Weber said. "Maybe that's a good way to describe it: Like they were not surprised at all by what I was saying." 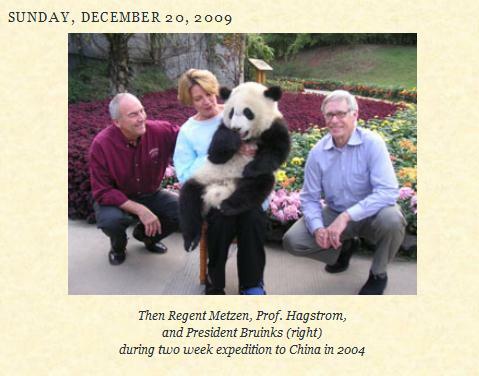 Weber says Metzen fired her April 29, 2011. St. Claire, a resident of St. Paul, was dean of business in May 2009. In her her lawsuit, she says she complained that Globe exaggerated its job-placement record and inflated its graduation rates. She says when she complained, Globe officials told her to mind her own business. St. Claire was fired last October. Attorney Clayton Halunen represents Weber and St. Claire, who are suing for lost compensation and damages totaling about half-a-million dollars each. "It's a big fraud. We believe that this type of thing should not be occurring and that the school should be honest," Halunen said. Metzen declined to comment. A Globe University spokesman said the company would not discuss the lawsuits before it received the filed paperwork. Deb Waldin showed up at Fairview Southdale's emergency room just after 8 one night last July with the worst pain she'd ever felt -- a kidney stone. While she waited to see a doctor, a man rolled a computer into her emergency-room bay and asked her to pay $750 or $800. "I'm like, are you kidding me? Here I am dying and I'm just going to reach over to my purse and give you my credit card?" She kicked him out but is still furious about it to this day. Waldin, 60, is just one of the patients to come forward with stories of aggressive billing tactics in the wake of last week's scathing report by Minnesota Attorney General Lori Swanson about abuses at Fairview hospitals. In a six-volume report, Swanson described how patients were harassed and manipulated after an Illinois consulting firm, Accretive Health, introduced sweeping changes to the culture of Fairview's seven Twin Cities hospitals and new strategies for collecting debts. Fairview officials say they can't address every reported abuse, including those cited by Swanson. Dr. David Hunter, a radiologist at the University of Minnesota, said he had heard complaints about the billing practices from colleagues at the university's hospital, which is owned by Fairview. But Hunter didn't really believe them until a couple of weeks ago, when a close friend arrived at the hospital for an MRI. The woman, a breast-cancer survivor, was ushered into a small room with a billing officer, who told her she had some unpaid bills to pay. "She said, 'What bills? I have paid all my bills,'" Hunter said. The man told her she hadn't received the bills yet, but still had to pay them. 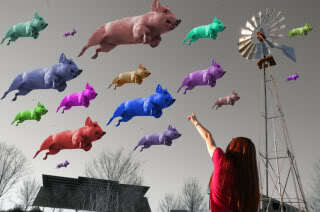 When she refused, the man pleaded that it would look bad on his record, Hunter said. His friend declined to be interviewed; but as a physician, Hunter said he was appalled. "It's targeting people when they're most vulnerable, which is to me ethically unconscionable," he said. It's shocking that Fairview allowed these disgusting practices to continue for as long as they did. My sympathies to the affected patients. Two observations: "nonprofit" hospitals act just like for profit hospitals, they always try to maximize revenue. The CEO and the CFO should be held responsible for this inappropriate financial behaviour. They should be given the opportunity to make their way in the "for profit" world. Fairview is awful. My son needed tests for possible cancer last year. They insisted we pay for all tests before we came on a credit card. When we got there, the doctor said we didn't need all the tests. I tried for months to get reimbursed for tests not given. Each time they said they would refund my credit card, but it never was. Months later they claimed they applied it to other bills of my family. Really?? How long a stretch is it from this sort of financial terrorism to the Ron Paul supporters' "Let him die!" attitude we saw during the primary debates? Eutice and Moen have to go.....they both comment like they were unaware these practices were going on right underneath their noses and implemented by their own sons. Utterly disgusting Fairview. I could be on my deathbed and would make sure the ambulance driver didn't take me to a Fairview hospital. As someone that has worked in a Fairview ER for over 10 years I can tell you that those caring for the patients don't care if you have insurance or not! We will treat you the same and often do not know or care how or if the bill is going to be paid. Those doing the patient care are in the business to do just that, care for the patient. I feel horrible that this has happened to patients as do my colleagues! I am so glad I am in the northern ring burbs where for the past 7 years I have only to deal with Unity and Mayo (for cancer surgery). I will never step foot in a Fairview hospital after this report. Fairview's problems started with the merger March, 1997. The bottom line is their top priority and now that they are experiencing severe financial issues due to the construction of the new Amplatz Children's Hospital, their bottom line will continue to take priority over the customer, their patients, and especially the employees of Fairview. There is absolutely no loyality to many who have served Fairview through think and thin. Again, Fairview's priority is the almighty dollar! This is crazy! There is a pattern of bad decision-making rampant at Fairview. They seem to flaunt all sense of ethical behavior. Not only did Dr. Moen have a blatant conflict with his son working at Accretive and owning stock in the company, but he is owner of a company called netclinic that he pushes as part of his current role. This has been going on for years. Another case where truth is stranger than fiction. When will this group of leaders be held accountable for their disregard of their most basic and obvious fiduciary responsibility?! If you've ever had a kidney stone you would not only think you were dying, you would wish you were dead. Expecting someone to deal with financial matters in that situation is as unethical as it gets. The bill collector might not be doing the torture themselves but they are surely trying to make use of it. Wow, I am really glad to hear about these problems with Fairview. Changing this type of culture takes many years. I plan to avoid Fairview like the plague. I'll take my health care work someplace else. Also, I plan to tell everyone I know about Fairview too. I don't want any of my friends or relatives trusting these folks at all. Fairview is definitely not my kind of place. It's too bad. I used to use their services but I won't do in the future. If Joint Commission (JCAHO) lowers Fairview's rating to "Provisional" they will NOT be able to be participating providers for most major health insurers(Medica, BCBS, HP). Fairview will also be removed as a 'Center for Excellence' for stem cell transplants and other high cost, specialty procedures. The investigation by JCAHO and CMS will have serious consequences for this health system. I just experienced this on Friday last week. I brought my husband in for a CT scan in the morning. Before he was allowed to register he was told by an admissions Rep that he would have to pay 780 dollars up front because we have a 2000 dollar deductible on our insurance. It was only after I informed her that we would not be paying up front for the service that she said that they wouldn't withhold treatment if we didn't pay. It is implied that you have to pay to receive services. Little do any of them know my deductible has already been met and all my health care is covered 100% for the rest of the year. This is an outrageous invasion of privacy and extremely unethical! Fairview has long "avoided" the controversies that have surrounded Allina, Healthpartners, etc. In this case the revelation that they had affiliated themselves with unscrupulous bill-collector's is less alarming than the financial, and nepotistic affiliation of President and CEO, Mark Eustis and Fairview Physician Associates President, Dr. Dave Moen. As Fairview operates the U of M Hospitals entities, I respectfully asked for the immediate resignation of Mr. Eustis and Dr. Moen! I have very good health insurance and I, too, was bullied by bill collectors in the emergency room at Fairview University. I was 17 weeks pregnant and about to lose my baby. I was doubled over in pain with the contractions when a bill collector came in and demanded $200. I told her that my ER co-pay was only $75 and that I would probably be admitted, in which case my co-pay would be waived. She insisted several times that I pay before my husband kicked her out. She made some sort of comment under her breath on her way out, but I couldn't hear her over my sobs. I have insurance and was also told as I made an appointment for an MRI how much it would cost. I thought it was odd. The scheduler asked me if I wanted to pay it (when I was scheduling) with a credit card. I said, "No. I have insurance." He proceeded to tell me my deductible and asked me if I understood how much I would be paying. I was really annoyed at his questioning. Of course I knew, would pay, and needed to have the MRI because of a possible brain tumor. Really disgusting conversation that made me feel like a dead beat criminal before I even came into the office. "I'm here for Don Vito -- er, Accretive Health -- and I'm gonna make you an offer you can't refuse." My sympathy to all who suffered at the hands of Accretive and their culture of greed. I won't be returning to Fairview. They may not be concerned about what their customers, err, patients think/thought, but Accretive is concerned about their investors after the stock loss of over 50% in value, and a securities fraud class action lawsuit filed last week. This is how Accretive understands the problem: "Accretive Health said it regrets that the recent activities of the Minnesota Attorney General have created a situation where Fairview felt it necessary to cancel its work with the Company in QTCC." Thank you Lori Swanson and the entire AG staff. The fact that a hospital or an insurance company is "nonprofit" doesn't mean that they're a charity. It just means that they don't have investors or sell on the stock market. Fairview's CEO Mark Eustis, for all of his crocodile tears about dept collectors, makes a cool $1,500,000 a year and got a 51% pay raise when many others' wages were frozen. People ARE profiteering off of nonprofit healthcare systems. It's just not investors. Fairview's comments act as if this company's actions was completely independent. It wasn't, Fairview hired them to do exactly what they did. The entire senior leadership team should be ousted for this. 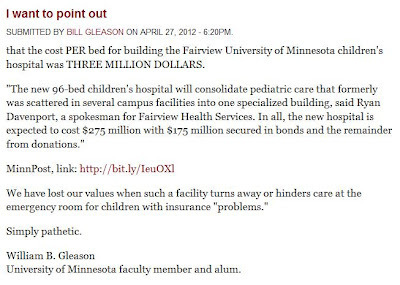 I have been disgusted for some time with the University of Minnesota's association with Fairview in the children's hospital wars in Minneapolis and St. Paul. This has resulted in a huge and unnecessary investment in new buildings that is a very good example of how flawed our health care system truly is. "Children as Pawns in the Latest Expensive Healthcare Competition." 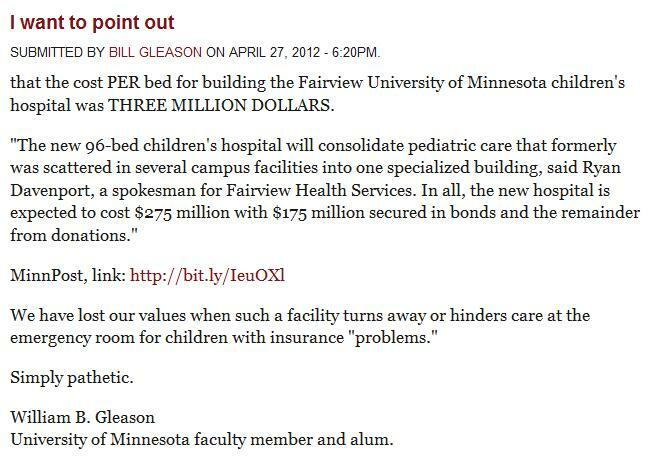 "Are Layoffs at Fairview/University of Minnesota Completely Unrelated to Children's Hospital Wars?" In one case, a child who sought treatment at the University of Minnesota Amplatz Emergency Room reportedly was kept waiting while the parents, who were uninsured, met with an Accretive "financial counselor. The incident prompted the hospital's own employees to question whether Accretive was violating federal law, which requires emergency rooms to see patients without such delays." According to the attorney general’s report, Accretive was derisive of such questions and complaints, even when they came from doctors. "I'm assuming this is a country club conversation that is getting floated around,'' an Accretive manager wrote in an e-mail to another employee. To make things even worse, it appears that two of the sons of Fairview executives were employed by the embedded debt collection agency. Two Fairview executives who helped forge a partnership with a debt collection company under fire for its aggressive tactics have sons who work for the firm, the Star Tribune has learned. One of the Fairview officials, Dr. Dave Moen, also owned stock in the collection firm, Accretive Health Inc. His son, 24-year-old Sam Moen, works for Accretive and helped implement the high-pressure strategies that Minnesota Attorney General Lori Swanson blasted this week, documents show. Fairview's CEO, Mark Eustis, also has a son who works for Accretive. Fairview officials now admit that "mistakes were made" by Accretive employees who allegedly hounded patients at its hospitals. The Eustis and Moen family relationships and Moen's ownership of Accretive stock were disclosed to the board of directors and vetted before Fairview signed contracts with Accretive in 2010, Mooty said. He called Eustis a person of "incredibly high integrity'' who is deeply loyal to Fairview. The CEO wouldn't let his son's job influence his management of the Fairview-Accretive relationship, Mooty said. However, to Prof. David Shultz, a lawyer and ethicist at Hamline University, the conflicts were severe and not defensible simply because they were disclosed. "This is a pretty bad one,'' said Shultz, an expert in business ethics and the governance of nonprofits. He said Moen and Eustis could have been swayed in their support of Accretive out of loyalty to their sons, if only subconsciously. Moen's stock in Accretive, which Fairview didn't disclose in detail, provided another level of bias, Shultz said. Ironic that U of M Fairview Hospital engages an Accretive manager named Crooks to respond to physician complaints about alleged patient harassment and abusive financial intimidation tactics that may violate state and federal law. Fairview Hospitals should issue a public statement apologizing for confirmed misconduct alleged by the Minnesota Attorney General's office, and promise to refrain from any and all misconduct in the future. People who are, or thinking about becoming, contributing donors to the U of M Fairview Amplatz Children's Hospital may feel compelled to put their contribution pledges on hold unless and until they are publicly assured by Fairview's attorneys, CEO and board of directors that patients and their families will be consistently treated with dignity and respect at all Fairview medical facilities, and will never be subjected to the despicable financial intimidation tactics alleged by Attorney General Lori Swanson. The Star Tribune should check spelling on its copy more carefully. It's not Accretive Health, it's Accretive Wealth. "Mistakes"? The only "mistake" is that they got caught. This is not new for Fairview. In 2000, a family member, who had lost a job and was not sure if they were still covered, was utterly harrassed by staff regarding payment while a patient. Another day at the medicine for profit machine. There seems to be a complete disconnect from Fairview's mission and the Farivew administrators who signed off on Accretive Health's hapless collection scheme. Ya think? You head to the hospital with some broken bones and who meets you at the door but Tony the Enforcer and a couple of his leg breakers, acting like they work for some loan shark. How we've perverted that word, "mistake." Breaking the law when you know are, but think you won't get caught, is not a mistake. Goon squads like Accretive Stealth are just filling a demand. Ya gotta love the passivity in the phrasing "Mistakes were made." I wonder if Fairview executives are similarly unaccountable when they're upholding their performance to their board at bonus time in asserting, for example, "Profits were made." As in "We may or may not have had anything to do with having accumulated them." I'm going to guess their modesty is a bit less in evidence in those circumstances. "Mistakes were made", what a load of unmitigated gall and arrogance. Having looked at Accretive Health's website, I find it almost impossible to believe that any intelligent, educated person would believe the claims made. Fairview is a not-for-profit health system. They are designated and are promised favorable tax treatment in exchange for a willingness to treat all patients who come through the door. This episode shows that they out and out disregard that promise. By doing so, the state and federal government should strip them of their not-for-profit status and make them pay taxes on their tremendous revenue. It's totally an 'oops we got caught' situation where they thought they could get away with thugs and scheisters strong arming the sick and vulnerable for money they didn't necessarily owe. I'm also looking for more info on the incentives held out to the "embedded" Accretive employees collecting credit card -- and patient -- information at the ER. One instance was getting to throw a pie in a manager's face if you were the top collector. Is that now open to all of us Fairview patients? I might put my pie in a concrete shell. It would, of course, be "a mistake" though. Golly! I'm shure it's just a coincidence that top executives at Fairview happened to have sons who worked for Accretive Health. I think it's time for some resignations. this situation is just another symptom of the depth of illness that has stricken the American health care industry. The children of two senior Fairview officials leverage their DNA to score a sweetheart deal for their employer. Doesn't anyone see a problem with that? The Fairview Board seems to be clueless as to how the management operates. What does it say about their knowledge of the companies operations if they had to hear about such an abusive program from the Attorney Generals office ? What does it say about the work culture at Fairview when its employees seem to be so scared to speak up ? What does it say about the lack of internal controls at Fairview ? Now, You' re being warned !! So as soon you get into a Fairview Clinic and Hospital, beware, Debt collectors with the blessings of Fairview Executives will be (have been already)using any of your health or financial data against you to collect any monies. So feel "free" to speak to a nurse or doctor at Fairview!!! I am very surprised by the poor judgment by the executives whose kids worked for Accretive and disappointed that the Board blessed this arrangement. Nepotism is nothing new at Fairview. I've been an employee at the Riverside hospital for 6 years, and nearly every department has issues with it. Children of managers are given better positions and first dibs on any openings. I happen to work in the registration department, and one of our managers happens to be a former managers daughter, her brother and a girlfriend of a brother constantly switch to better positions without interviews for other employees. Accretive was in direct control of our department, we were pushed to collect as much as possible even though it was known that patient liability was based off of a rough estimate and that Accretive's software often gave faulty information. After it was announced that Accretive would be leaving our direct manager told us to "keep doing things as we previously were" and that collection amounts were expected to stay consistent because corporate was keeping an eye on our totals. Eustis is trying to shift blame to Accretive but Fairview (on multiple levels) was completely complicit with their practices. In response to this statement: Eustis denied that Fairview broke any laws, but acknowledged damage to its reputation. "This isn't what we're about," he said. "We're here to provide great service and treat people with dignity and respect every day, and 99 percent of the time we think we do that." Respect should begin with your Employees so they can provide great service. Your employees are the ones providing great service. They find it very difficult doing this when there aren't enough of them and they are overworked and disrespected! Patients are coming into Fairview Hospital under duress and Fairview - through its collections agent - descends on them like vultures. Fairview say it was a mistake. It certainly was not an honest mistake. Shame. 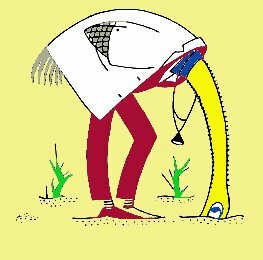 As a physician, Dr. Moen should resign. His case is worse than Eustis, at least the latter doesn't hold Accretive stock. It's disappointing that Fairview's board of directors is so insensitive to public opinion and ethical guidelines they approved the incestuous relationship between its top executives and a shady bill collector. A hospital that receives taxpayer dollars should not be run like a payday loan company. More passive corporate speak and watering down of corporate crimes..."Mistakes were made..." This statement comes out of corporations and governments all the time. That way no one has to stand up and take blame! "Mistakes were made." The biggest one, of course, was in getting caught. I agree, this activity can't be explained away with a simple "oops"...these execs need to be held accountable for their indefensible actions. A large fine against Fairview, and a couple of terminated execs at a minimum. I used to work for Fairview and left because it was the most unethical company I have worked for. Yes, they broke several laws here. First, it was a violation of HIPPA for them to release the patient info to the outside company, secondly it is a violation of the EMTALA law to force people to pay for emergency treatment before getting treated. How can the Board not realize this - Fairview crams these laws down the employees throats so they don't break the law in day to day practice, but the senior management feels it is OK for themselves to break the laws. Fairview, you are unethical, and broke the law!!! Time for the CEO to put on his big boy pants and admit he broke the law. The CEO needs to be criminally charged!!! My son went to Fairview Southdale last September for an appendectomy and my wife was all but coerced to providing a credit card while waiting for treatment even though we have medical insurance. We were charged for a guesstimated deductible (which was finally refunded to us 7 weeks later). I couldn't believe it. Thank you Lori for looking out for the rest of us. I still don't like that the U of M hospital has been privatized. Fairview spends big bucks advertising their clinics and hospitals as better than average. This sorry mess completely negates any good will they had with many potential consumers. They had lousy billing and customer service 20 years ago and apparently still have bad billing. I just retired and was considering changing my clinic and hospital for convenience. I will not do business with Fairview until the upper management is changed or apologizes. This REALLY ticks me off. I am one of those lucky folks who had their personal information put at risk by these leeches. And now it turns out they are behind the recent turn towards the Draconian at Fairview?? Beautiful. 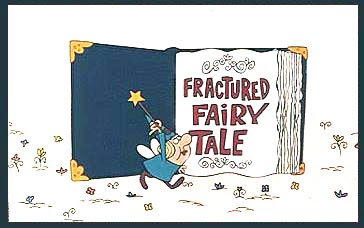 Fairview should thank its lucky stars there are some poor fools out there like me who have regulated insurance that insures I cannot go to another care system. The story of Lori Swanson's action against Accretive made the front page of the NY Times on line this afternoon, and provoked hundreds of comments. This truly strikes a nerve. Maybe hospitals could curb their advertising, excessive building upgrades and focus on providing direct patient care. It is very much illegal for any hospital or clinic to demand money up-front for services that haven't been given. I have worked in healthcare for 10 years and that is a HUGE no-no. I've had my own problems with Fairview's billing practices and illegally balance billing me for what insurance didn't cover that wasn't part of the co-pay or deductible. I had to threaten to sue them to make them back down and hire an attorney to sort it out. I have refused to go to Fairview for healthcare ever since and I tell everyone I know how deceptive they are. Fairview tried the same thing on us when doing a "pre-admittance" information screening regarding my wife's cancer surgery. When they pushed for prepayment of our portion of the bill ( we are fully insured with pretty good insurance)and balked when I said I would pay afterwards, I told them that either they dropped the issue right then or the next conversation would be with my attorney. Same thing happened to us last January 2011 - I had to take my son to the ER for a split lip; in rolled the guy with computer on the tall wheeled podium. "Here's the estimated charge for today's visit; credit card please" - they get you when you are vulnerable and this time zapped almost a thousand bucks out of my credit card. I didn't like the practice - hadn't even been seen by a physician and here's your bill. Pay it! Nice. Glad to see that they've been booted out. Really, I wasn't inclined to go back and use their ER services again if the need arose because of that. President Kaler was the speaker at the March 23 meeting of the Civic Caucus. See his Vision of the University. Here is additional information on the issues he discussed. 1. "When people complain about tuition, I tell them to talk to legislators." During the past 10 years the administration has increased spending on operations by 50% to $3 billion per year. The senior administrators have financed their billion dollar increase primarily through skyrocketing tuition that has more than offset the reduction in state appropriations. The administration has declared that "tuition is the revenue stream with the highest potential for significant, long term growth." See New Fiscal Reality No. 2 at p. 8 of the 2009 Report of the Future Financial Resources Task Force; see also Recommendation No. 2 (Grow Tuition Revenue) at pp. 7, 51-52 of the 2011 Financing the Future Report. The broader problem is that the vision should be that this is a university where the best courses are taught, but it is moving to teaching courses that instead make the most money. See p. 6 of the December 22, 2011 FCC report. 2. The Regents recently approved a differential tuition structure that will enable the business school to thrive financially and to compete in recruiting faculty. In fiscal year 2012 the University received $484 million in state appropriations for its general fund. The administration allocated $3.3 million (0.7%) to the business school. The amount that the business school collects for tuition, fees, and executive education tuition increased from $54.9 million in fiscal year 2007 to $72 million in fiscal year 2011. The amount that the business school receives from endowment earnings and gifts increased from $8.3 million in fiscal year 2007 to $10.5 million in fiscal year 2011. If the business school truly needs additional funds to hire faculty, then the administration should increase the minuscule percentage of state appropriations that it now allocates to the school--not impose an even greater financial burden on the undergraduate students and their parents. See Going To Market Part II. 3. " 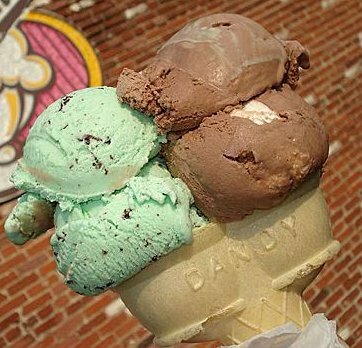 We are the Silicon Valley of the food industry." As the senior administrators at the U of M looked for ways to increase profits, they decided to transform UMore Park into a unique combination of a commercial gravel pit and a utopian residential community. They told the Regents that this new business model would generate from $3 million to $10 million in revenues each year. This projection turned out to be wildly unrealistic. See section 1 in University Inc. Part II. The gravel pit will be located on land that has been used for agricultural research that has produced hundreds of millions of dollars for the economy of Minnesota. It appears that the senior administrators and the Regents made the decision on UMore Park without consulting with either the professors who are engaged in the research or any agricultural economist. See Rethinking MoreU Park. President Kaler has asked for a "reassessment" of the plans for UMore Park. See Return To Sanity? The practical obstacle to any reassessment is the 40 year lease for mining that the Regents approved in November 2010. 4. The University of Minnesota does particularly well in its research efforts and comes in eighth in the nation among public universities for the amount of sponsored research it performs. Federal grants cover only part of the hundreds of millions of dollars that the U of M spends on research each year. Only a few universities realize sufficient revenues to make a profit on research. See On The Hidden Cost of Research. As costs have mounted and federal grants for research have declined, the universities have looked more and more to corporate sponsors. See the December 10, 2011 Pioneer Press report on U Open for Business Research. This has produced a blurring of the priorities of non-profit institutions of higher education and the priorities of for profit corporate sponsors. See The Markinson Files and Continuing Disgrace. The increasing reliance on corporate funds can also cause senior administrators to attempt to block the public presentation of research that might offend major corporate donors. See The Troubled Waters of Big Ags Influence. 5. "I'm less concerned about salary levels because the market is usually pretty clear about that." On March 6 President Kaler made a similar remark to state legislators when he told them that the current compensation of senior administrators is necessary "in a highly competitive global market for top talent." See the March 7 Star Tribune report. See also The Cost of "Top Talent" Part III. This is the same justification used to pay extravagant compensation to Wall Street executives. The "Masters of the Universe" who are the chief executive officers of those Wall Street firms have an unwavering confidence that the market always makes the correct determination in economic matters. Their misplaced confidence combined with greed to bring our national economy to the brink of chaos. A laissez faire reliance on "the market" is an abdication of personal responsibility. Yet on March 9 the Regents issued a news release in which they expressed "confidence in President Kaler's responsiveness to this issue and his careful, watchful and prudent approach to financial management." See the University News Release. Non-profit institutions of higher education are not Wall Street firms. The law restricts the pursuit of personal wealth by the leaders of tax-exempt organizations (such as non-profit universities). See Section 3 and the Postscript to $tate of the University--A Parent's Perspective. Lavish compensation is not necessary to attract qualified persons to public service. The compensation of senior administrators at the U of M far exceeds the compensation of senior administrators in state government who have similar qualifications and duties. See On The Cost of Administration. [The University] can elevate the brand in the minds of the citizens and make it meaningful to them--and like it or not, intercollegiate athletics is an important part of the brand so the University must do a good job of it. See p. 12 of the February 23, 2012 report of the FCC. The budget for the U of M athletic department is now $78 million, and it is increasing by millions of dollars annually. Each year the athletic department receives a multi-million dollar subsidy from the general fund of the University. Meanwhile, the administration continues to cut courses and faculty positions and to replace professors with part-time instructors. See Expensive Icing. How does this make the University meaningful to the students, their parents and the citizens of our state? Perhaps the Regent dreams of championship teams in the major sports that will finally produce widespread alumni support for academic programs. The fact is that schools that provide a quality academic experience for undergraduate students dominate the rankings of school by percentage of alumni donors. See Maturi Decision. As for "elevating the brand in the minds of citizens," the high profile sports at the U of M (and at other universities) have recurring scandals that tarnish the reputation of the institution. See section 7 in Course Correction in Higher Education. Using big time college sports to create a "brand" simply propels the U of M further along the athletic arms race--a race that is unrelated to the academic mission of the University. 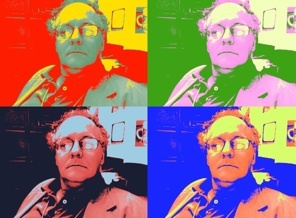 See the March 30, 2012 column by Joe Nocera in The New York Times on Orwell and March Madness. Even on a strictly economic analysis the continuing participation in the athletic arms race is a losing proposition. The most recent NCAA annual report describes "a widening gap between schools with self-sufficient athletics programs and schools [such as the U of M] that rely on institutional subsidy to balance their athletic budgets." See the June 15, 2011 NCAA report. The solution is to disentangle the University from the big business of the major revenue sports. See the final paragraph of Expensive Icing. incredibly positive trajectory that we have been on." The State Human Rights board found she fired an employee who filed a workplace complaint. University of Minnesota Nursing Dean Connie Delaney, who is already under university reprimand for a hiring infraction, now faces a state human rights finding of discrimination and retaliation for firing an employee who filed an internal workplace complaint. The probable cause ruling, issued in February by the Minnesota Department of Human Rights, could result in state mediation or litigation. It centers on an executive assistant whose job was terminated by Delaney in 2010 after she went to the university's Equal Opportunity and Affirmative Action Office (EOAA) with allegations of unfair employment practices. Within weeks of learning about the complaint, Delaney decided not to renew the employee's appointment, the Department of Human Rights investigation found. "The Department has concluded that the [dean] terminated the charging party's employment as an act of reprisal discrimination,'' according to a case memorandum issued by state Human Rights Commissioner Kevin Lindsey. "The investigation yielded extremely persuasive evidence ... that there was indeed a causal connection'' between the worker's dismissal and her EOAA complaint against the dean. Lindsey also issued a probable cause finding of disability discrimination in the case. Evidence indicated that the worker performed "very well'' in her job and had physical ailments, including multiple chemical sensitivity syndrome and an anxiety disorder that qualified her as a disabled person. The disability finding was based on evidence that the dean was indifferent to the accommodation needs of her aide and was unhappy when she took time off for doctor's appointments. The Human Rights Department concluded that the worker's disabilities also were "likely factors'' in her ouster, the memorandum said. Delaney referred questions to University General Counsel Mark Rotenberg, who said the former employee's complaints are still being addressed. Rotenberg emphasized that there have been no findings of guilt or innocence and said the university has significant evidence showing that no unlawful action was taken against the worker. Delaney, who was hired from the University of Iowa in 2005, was reprimanded last month for her 2007 hiring of Thomas R. Clancy, a former Ph.D. student of hers at Iowa. Against university policy, he joined the U's faculty as a clinical professor at 75 percent time while continuing to work 100 percent time at Mercy Hospital in Iowa City for 17 months. Delaney knew of the arrangement, which was not properly reported at the U, the reprimand said. . The Star Tribune received a copy of the Human Rights findings from the former worker on the condition her name not be published. She and her attorney are considering how to proceed. They have the option of conciliation mediation through the Human Rights Department or suing the university in state court. Delaney called an all-school assembly March 19 to discuss issues raised in the Star Tribune story, and she has written to students, faculty and external supporters. She has expressed regret for employment contracts granted to her brother and accepted full responsibility for non-compliance in the hiring of her former student. But those communications also have stressed school accomplishments under her leadership. "I regret that, in these times, we have not been able to maintain our focus on the incredibly positive trajectory that we have been on as a school, but have needed to stop to look backwards,'' Delaney wrote to students. I think the dean needs to go. If this were private industry, Delaney would've been terminated long ago. It just keeps getting better and better for the U. Anywhere but Minnesota and she would have been history by now. How do these seemingly unstable administrators keep rising to the top for these positions? How does this lady still have a job? Corruption, nepotism, incompetence=U. of MN. It is disturbing to think that the articles about the lack of ethics and gross mismanagement at the U are just the tip of the iceberg. U of M president Eric Kaler must fire Connie Delaney immediately. If this story was a stand alone article it might not be such news, but with all her other acts it speaks to her lack of credibility and integrity. Kudos for Kennedy. The U has been held unaccountable for so many offenses over the past 10 years or so it's sickening. They live in their own little world, accountable to no-one, and totally unable to police themselves or even have the slightest degree of integrity. The new U President wrote a letter to the editor some weeks ago saying what is past is not his fault, judge him on what he does in the future. Here is his chance. We are watching. I am amazed at the responses from folks ready to vilify the former employee and defend the University. Way past time for her to hit the bricks. Delaney's track record of turmoil didn't begin at the U; her methods and behaviors are well known elsewhere - which brings the spotlight back to U of M administrators that hired her and failed to do due diligence. Frank Cerra should have dealt with the problems in Nursing before they became this bad. Extremely high staff turnover, such as the School of Nursing has experienced since the arrival of Dean Delaney, is a sign of a problem. I applaud this investigation. This once great institution has lost its luster by its "leaders'" lack of vision and cronyism. Business as usual must end. The former President, Robert Bruininks, guided over $2,000,000 to departing employees, and directed more than $350,000 to his new "post" on the faculty, where he will earn $341,000 a year for up to six years. Neat gig for an otherwise nice guy who did absolutely nothing other than to passively watch over the drift toward mediocrity. And now we have the Nursing Dean's issues. Start a new era at the U of M by cutting the cord of these nightmare administrators. Make a statement that the shrinking resources which are directed to the U of M will not be rewarding or perpetuating mediocrity. Where is the accountability here? There are at least two other little dictator supervisors under investigation right now in different departments over there. HR needs to step it up. This is a classic U of MN management style. You have people in positions of authority that answer to no one, and they have a revolving door for their support people. I had the pleasure of working for someone who was a professor that hated students - yes, hated the people they were there to support, nurture, and supply an education. The university turned a blind eye to it since this professor was good at writing grants to get money for the school. There is not a single person in the department that has been there for longer than two years because no one can handle the stress that is piled on due the professor's inability to deal with it themselves. Kaler said "watch what I do," and we're watching. He may not do a thing because of money. Besides being dean of nursing the dean is also heading up the U's informatics department and it has *millions of dollars* of federal money. Who knows if she's lying and cheating there too, and someday the feds may catch her and the u will be in even deeper trouble? What a risk keeping someone like her on board! Where are their heads? If she had any insight into the embarrassment she's causing, she'd do the University and the Nursing School a favor by stepping down as the dean. @all the U insiders and maroon & gold goggle wearers complaining about Kennedy's journalism. Kennedy's journalism is EXACTLY what the fourth estate is supposed to provide but over the course of the entire Bruininks administration pretty much failed to. As an alum of the U, I'm glad the Strib is finally reporting on the endless problems at my alma mater. Frankly, Kennedy could publish an article a day for the next 5 years and still likely not have unearthed everything worth covering. How many times can the Dean misuse her position and power? Why must the community and those who work for her have to pay the price for her lack of morals and integrity? As I mentioned in a post on the first article, as an alumnus of the School of Nursing I interacted with the Dean in various settings, I decided several years ago to vote with my pocketbook...out of my will forever! The School has had a great reputation for over 100 years of educating nursing students; I hope the Board of Regents etc. can see it in themselves to move her out and look for the BEST!!! The School deserves better!